Our easy to make Salted Dark Chocolate Peppermint Bark makes a wonderful gift idea for the holiday season. 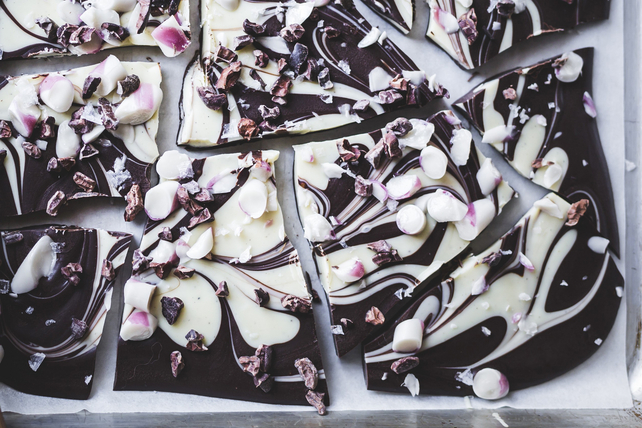 Featuring 70% cacao dark chocolate, white chocolate, crushed peppermint, marshmallows and just a touch of flaky salt, this delicious bark is sure to become a new holiday tradition. Microwave dark chocolate in microwaveable bowl on MEDIUM 1 to 2 min. or until almost melted; stir until completely melted. Repeat in separate bowl with white chocolate. Drop spoonfuls of chocolate mixtures alternately onto parchment-covered baking sheet; swirl gently with knife. Refrigerate 1 hour or until firm. Break into 18 pieces to serve. Prepare recipe as directed except omit the salt. You will need to crush about 4 regular-size candy canes to get the 1/4 cup crushed candy to prepare this delicious bark.